We chit chatted about life, love and food over a glass of Portuguese chardonnay and shared a couple dishes. Now to the timeline of this yummy night. 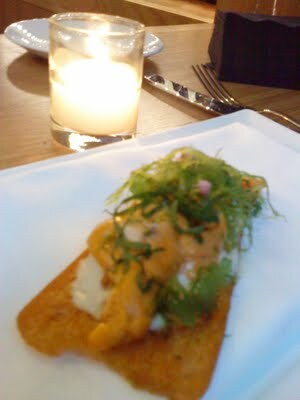 We started with a Petisco (small bite) of Sea Urchin Toast with cauliflower cream, sea lettuce, and lime. The toast was crispy and extremely buttery (so much butter, I thought Paula Deen was around… that’s a good thing). Add to that the creamy and sweet uni (this chubby loves sea urchin), melting in your mouth as it mixes with the mild and fresh cauliflower cream, topped with slightly salty and crunchy sea lettuce and a hint of lime, it was one of those dance all night long kind of party in my mouth. I wish I had ordered my own and didn’t have to share. 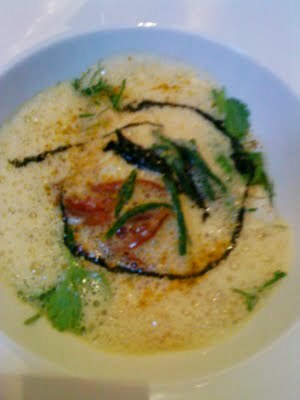 The uni toast was a tough dish to follow, but the Baby Cuttlefish in Coconut-Curry Soup actually surpassed it! Tender baby cuttlefish swimming in a foamy pool of herb puree and squid ink, oh so savory and aromatic. The fresh herbs were bright, while the coconut played the sweet role, the curry gave it a bit of personality and the squid ink completed this masterpiece with a swirl of saltyness. Thankfully there was enough toasted bread to soak up every last drop the the soup/sauce. Yummy Yummy Yummy! By now you must be thinking, oh wow, this meal is getting better and better, so did we, but that expectation went flat when we tasted the Foie Gras Terrine with spiced fig tuile, cocoa and fig ice. This was the most expensive item we ordered, and I try so hard to like it, I wanted to like it, I mean what’s not to like, it’s “fat liver”. 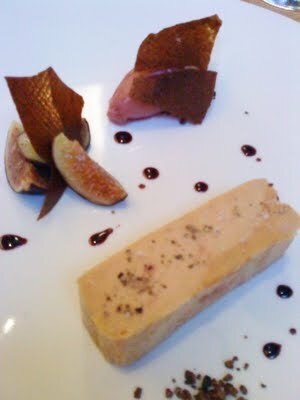 But when we just had such a high from the first 2 dishes, this was truly disappointing, the foie gras was gamier than any other I’ve tasted and I didn’t recognize any fig flavor in the fig ice, just sugar. The 3 slices of fig were the best thing on the plate, we both agreed we had better foie gras elsewhere, and each element on the dish seemed foreign to each other, we couldn’t manage to finish it. I still wanted the grand finale to a very enjoyable meal (overlooking the fois gras), so I convinced my friend to share a dessert, Sonhos “little dreams” which was basically hot fried dough dusted in sugar, comparable to a donut. 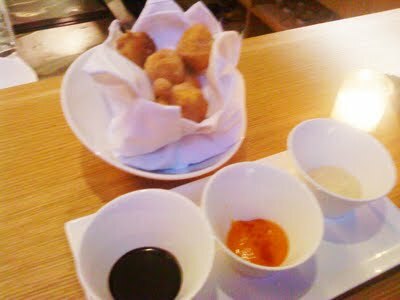 The outer layer was crispy and sweet, which we enjoyed, but the inside was a bit too mushy, though the 3 dipping sauces saved the day, spiced chocolate (dark and rich, my favorite), smoked paprika apricot (like homemade jam), hazelnut praline (creamy with a kiss of hazelnut). Overall it was a meal with very high highs and small-scale low. I would love to revisit and sample other seasonal items on the menu or just repeating the uni toast and cuttlefish. This place is no doubt a great new addition to the Flatiron dining map, it gives my other neighborhood favorites like Basta Pasta and Boqueria a run for it’s money (or menu in this case). I LOVE the sound of the dessert. I don't get why the foie gras wasn't good, though. It's pretty hard to screw it up. You didn't say what you drank. Anything good? Yay, thats me! MIA MIA MIA!